Use the Format Painter on the Home tab to quickly apply the same formatting, such as color, font style and size, and border style, to multiple pieces of text or graphics. The format painter lets you copy all of the formatting from one object and apply it to another one – think of it as copying and pasting for formatting. Select the text or graphic that has the formatting that you want to copy. Note: If you want to copy text formatting, select a portion of a paragraph. If you want to copy text and paragraph formatting, select an entire paragraph, including the paragraph mark. The pointer changes to a paintbrush icon. Use the brush to paint over a selection of text or graphics to apply the formatting. This only works once. 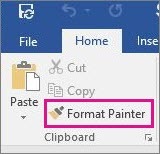 To change the format of multiple selections in your document, you must first double-click Format Painter. To stop formatting, press ESC. For graphics, the Format Painter works best with drawing objects, such as AutoShapes. However, you can copy formatting from a picture (such as the picture's border). The Format Painter can't copy the font and font size of WordArt text.